NOBEL PRIZE-WINNING economist Joseph Stiglitz has criticised the Irish government’s plan to appeal the European Commission’s decision that Apple owes Ireland €13 billion in back tax. Stiglitz, who was on Today with Sean O’Rourke this morning to promote his new book, said that the government’s decision to appeal was “wrong”. In a statement yesterday, Minister for Finance Michael Noonan said the government wants to appeal because it says it never gave favourable treatment to Apple, and all tax was paid in full. Minister for Education Richard Bruton, who was on Sean O’Rourke before Stiglitz, reiterated Noonan’s views that Ireland had done nothing wrong. What the Minister was saying was all utter balderdash. The fact is that you were encouraging tax avoidance and you knew it. Let’s not make any pretence about it. Yesterday, the European Commission found that Apple had participated in tax avoidance on a massive scale between 2003 and 2014. All profits made by the company on its European, Middle Eastern, African and Indian sales were effectively being routed to Cork, where they were subject to the lower tax rate. The effective tax rate in Ireland in 2014 was 0.005% according to the European Commission. Stiglitz said that our tax policies to attract foreign direct investment were short-sighted. You got a few jobs at the cost of stealing revenues away from countries around the world and that’s the kind of activity that has to be stopped. Another noted economist, Paul Krugman, was asked to comment on the tax case on Business Insider. Minister for Public Expenditure Paschal Donohoe said that the government is worried that if the companies that settled here can’t rely on our tax regime, they will relocate. The Irish national interest is so clear here. The companies we’re referring to … corporation tax alone each year for Ireland is worth €7 billion. 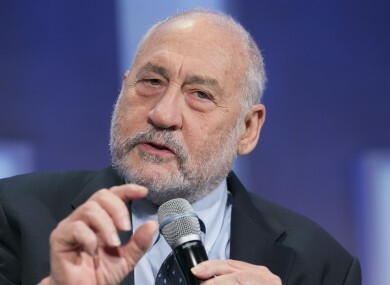 But Stiglitz said: “The argument that you’re going to lose a lot of jobs is absolute nonsense. I think Ireland can provide a lot. It has a well-trained labour force, a disciplined labour force and that’s the basis on which countries should compete. So this idea that all these people will leave and that jobs will disappear is a vote of lack of confidence in Ireland. Stiglitz said he found it “absolutely mystifying” that the government didn’t take the €13 billion to help the Irish people. Email “'Utter balderdash': Nobel-winning economist slams government's decision to appeal Apple windfall”. Feedback on “'Utter balderdash': Nobel-winning economist slams government's decision to appeal Apple windfall”.